The kiddo managed to get another Halloween out of last year’s homemade Minecraft Spider Jockey costume. 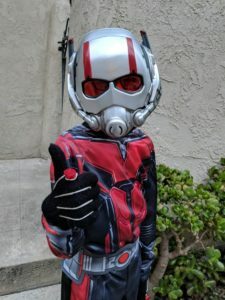 But it’s not easy to run around and play in, so we offered to buy him an alternate for parties, and he chose Ant-Man. Curiously, the costume didn’t come with gloves, so Katie took a pair of plain black gloves and attached controls to them. Oh, and check out this year’s pumpkin carving as well! Hardly anyone saw it, because all the trick-or-treating action seemed to be a block away, and no one walked up to our door until 9:00. 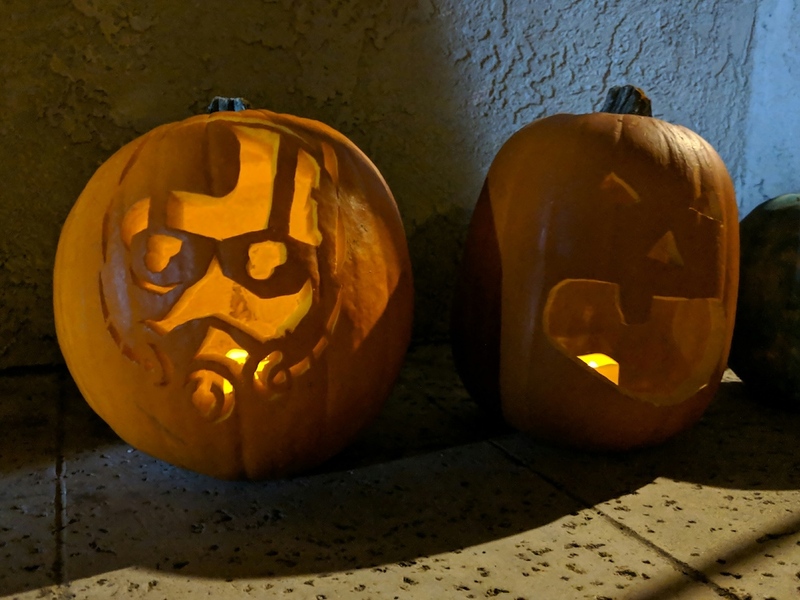 Ant-Man’s helmet is carved on a real pumpkin. The goofy face on the right is a plastic one from a few years back. This entry was posted in General and tagged halloween, pumpkin, superhero on November 1, 2018 by Kelson.